It is announcement time for Download 2014. The last two years I’ve been genuinely excited about this time of year but this time not so much. I think it is because I knew before any bands were announced it was exceedingly unlikely I’d be there for the whole weekend. I already went back on my “no festivals in 2014” proclamation by booking to go to Wacken, but I just couldn’t see how Download could be as good as the last couple of years have been. On the festival front, I am considering Hellfest as well as Wacken, but we shall cross that bridge when the time comes. There were a number of rumours circulating about the headline bands for the 2014 installment of Download and I have to be honest, no combination of headliners that I read excited me enough to say “if that is the one, I’ll go”. It was then announced that this week, the announcement schedule would be a headliner and sub-headliner each day until Wednesday. So the 6 biggest bands on the bill would be confirmed by the middle of the week. That time is now and the confirmations have happened. So let us have a look at who has been confirmed. Where to start? Well, I guess Friday would be appropriate. I can’t really say much about Rob Zombie. That is mostly because I don’t know much by him and haven’t really felt inspired to go find out. I’ve heard some stuff which has been alright but not amazing. Hey, some people love him though so I guess they’ll be happy. What about the headliner? I went to Download 2011 for the day to watch System of a Down. The special guest or sub-headliner that day was Avenged Sevenfold. I’m not their biggest fan and thought they sounded dire supporting Iron Maiden in 2008. This set however was really very good and, while it didn’t make me a fan, made me realise this was a band that was set for bigger things. They had already headlined the Saturn stage at Sonisphere in 2009 (although I couldn’t tell you if they were any good – I stayed in front of the Apollo stage to keep my spot for Metallica). If I can quote myself from my 2011 review (of course I can, it was my review!) – “This band will be a festival headliner soon, and based on this performance it will be well deserved.” Since this show, they have released a new album which some people have called a covers album. Some people have said it is their best album to date. For me, it is a reasonable album. It isn’t bad, but I’d be surprised if it is the album to make them massive. Then again, I could well be wrong. Hail To The King (the song) is a damn fine song though. Anyway, I said Avenged Sevenfold would be a headliner, and they are. To be honest, this is hardly a surprise either after the amount they were randomly promoted at last year’s festival and how the festival booker was one of the people who said their new album was their best yet. I’m still not what you would call a fan of the band, nor am I a “hater” – what this does mean though is their booking doesn’t do a whole lot for me personally. Following on from Friday is Saturday and that is what I shall discuss next. I am surprised that going into the 12th installment of the Download festival next year, that it will be the first time that Fall Out Boy have played. They are a good booking. They are a fun live band who will attract a large crowd I imagine. I saw them at Reading this year and thought they were quite good. I had hoped for a slightly better setlist but that was due to me not knowing the new material very well – my fault, not theirs. The headliner for this day is Linkin Park. I loved their first two albums. The second two I don’t like. I have very little desire to see them live so this for me isn’t the best booking. The fact they are going to be playing their debut album – Hybrid Theory – in full is an added draw for them but not one that makes me want to shell out my hard earned clams in exchange for a ticket. Hybrid Theory is 37 minutes long (thanks for that info Team Rock Radio!) which means they’ll likely have another hour to fill if not more. While I would love for them to fill that time playing their second album, Meteora, the chances of that happening are slim to none. As I said earlier, I have no real desire to see Linkin Park, playing Hybrid Theory in full or not. Fall Out Boy is a good booking but they are not enough of a draw to get me to buy a ticket for the festival, especially as I saw them not that long ago. The final day of this festival is the Sunday and that is where we have arrived at now. Alter Bridge have done two arena tours since they last played Download in 2011 and have earned the right to be in this position. They headlined the second stage back in 2006 and have just continued to creep up the billing each time they play. They have just released a great album and I think will do great in this slot. Could they headline the festival by 2017? Absolutely (I say 2017 as that will be 3 years after this festival and will give them the chance to release another new album and really solidify their slot as a festival headliner). 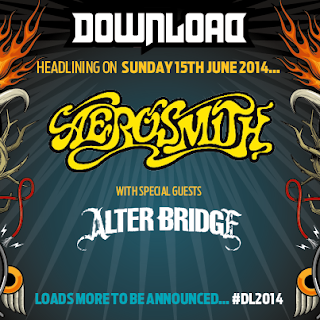 Aerosmith headlining the Sunday is a quality booking as far as I am concerned. They are a great band who rarely play in the UK so them headlining Download is a good thing. 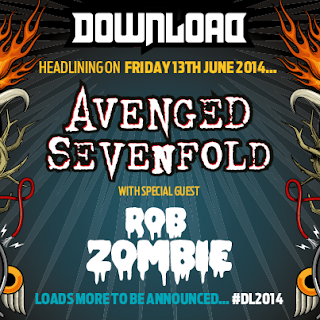 That is the major announcements for Download covered. They have also announced that Dying Fetus will be playing as a result of an online joke. I am indifferent to that announcement. Overall, the line up is fairly reasonable. There is only one band on the billing that makes me want to buy a ticket and that is Aerosmith. Don’t get me wrong, I like Alter Bridge and Fall Out Boy, and hell would probably watch the other bands that have been announced unless someone better (in my opinion) was clashing with them. But aside from Aerosmith, there is nothing there that really excites me. 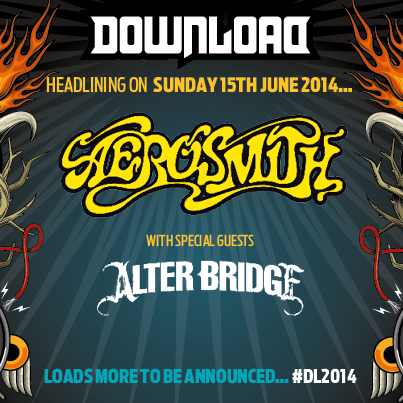 Last time Aerosmith headlined Download, they also did a London date at the o2 arena, so I will be keeping my eye on whether that happens again or not. If it does, I might just head there. We shall see. There is also the concern over repeat headliners. I’m not so much talking about Aerosmith when I see this (although it will be the second time they’ve headlined the festival). 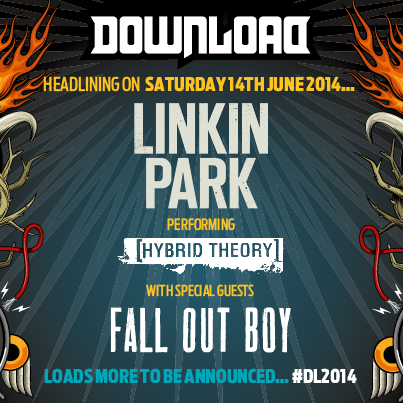 I’m more referring to the 2014 installment of Download being the 4th time that Linkin Park have headlined. That seems a lot to me. Every 3 years though isn’t too bad I guess. Maybe I’m just justifying not buying a ticket now, who knows. I’ll keep my eye on Download and future announcements, but I think as it stands, I won’t be there this year, which is a shame as (campsite walk aside) I really like the festival.